Depending on your neighbourhood, there will be a beauty salon, hairdressers or hair product shop available for you to get your must-have hair products. But where did the idea of selling black hair products on a mass scale come from? And who looked at this niche market as a means of basing a successful business on? The answer is Madam C.J. Walker. Born on December 23rd 1867 into a family of sharecroppers, Walker was named Sarah Breedlove at birth and turned an uneducated background into a hair product dynasty that can be highly admired today. Her name which has been largely documented in history, derived from placing ‘Madam’ before her third husband’s name C.J. Walker. 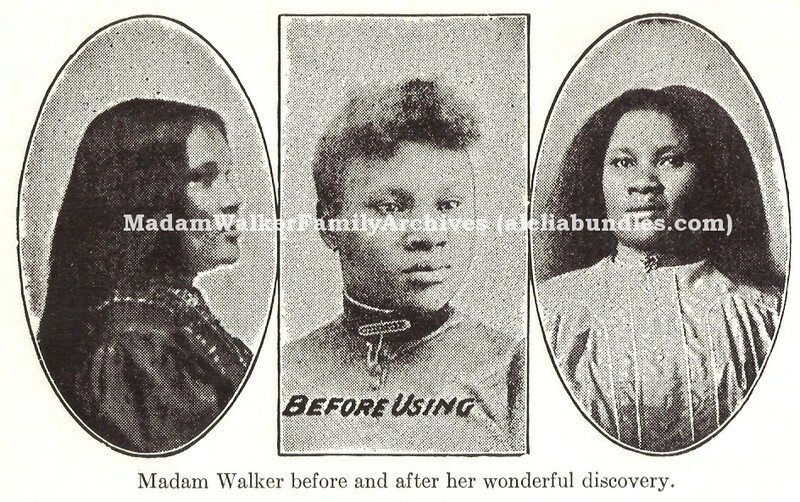 In the 1890s, Walker suffered from scalp ailments so decided to create homemade remedies as well as, also using products from the Annie Malone brand – a black female entrepreneur at the time. From growing up in humble beginnings, Walker became a sales agent in 1905 for the Malone brand, after moving to Denver – the place in which she met and married her third husband. After her name change, Walker decided to found her own business in which she sold a formula which helped heal and condition the scalp. It is said that the idea for Madam Walker’s Wonderful Hair Grower came to her by way of a dream she had and by looking at these pictures here, you can see why this product would have been so popular at this time. Some of the ingredients used in the formula had to be sent for in Africa but because of the her dream, Walker took the necessary steps to get them in her possession. To promote her hair products, Walker travelled throughout heavily populated black areas in and sold door to door. In 1908, Walker opened the Lelia College (named after her daughter A’ Lelia) as a means of training hair culturists, to help people learn how to care for their hair. Walker hired Walker Agents to help sell her products on a wider scale and created a national association and cash incentives for them in order to instil loyalty amongst them; she also did not want to be the only one benefiting from her success. Walker was widely acknowledged and recognised for her entrepreneurial skills and philanthropy, as she can be regarded as America’s first female, self-made millionaire. With pinnacle women in our history such as Walker, we can pave the way for even stronger, ambitious women in the next generation. Madam C.J. Walker…we salute you!